This easy chicken legs recipe is not only a delicious meal, but it is a low-cost dinner as well! If you love easy dinners, this classic chicken leg dinner was something my mother made a few times a month. It is quick to make and perfect for those busy school nights. 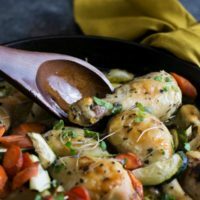 You are going to love this easy chicken drumstick recipe because it has simple ingredients and cooks together in just one pan. That makes clean up a breeze! One thing I remember about this recipe growing up is that you can use any vegetables that you have in your refrigerator. This recipe is gluten free, dairy free, paleo, and whole30! Another great bonus about chicken legs is that they cost a lot less than other parts of the chicken, even for organic! If you need to feed a crowd, this is a great way to do it. (*And a bonus, you can use chicken thighs if you don’t have drumsticks on hand!) If you like bread with your meal, give these Gluten Free Cornmeal Fontina Scones a try! You can saute these chicken legs in your cast iron pan, or you can bake the chicken in your oven. 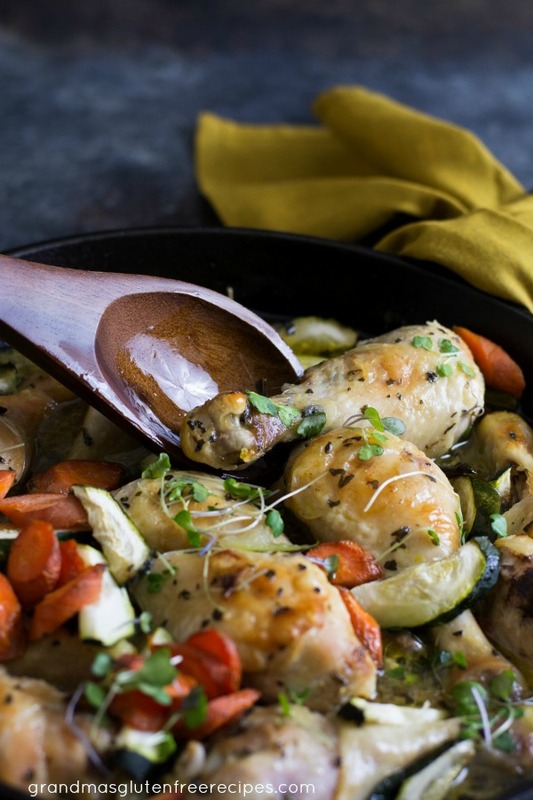 Just put the cast iron pan of chicken and veggies into your oven. Make sure your baked chicken legs have an internal temperature of 165 degrees! This is one of the easiest drumstick recipes to make. Here are some great tips on how to bake chicken legs. Sautéing chicken legs is a great way to keep them moist and delicious. Barbecue chicken legs can be made in the oven or on a grill. You can also toss the chicken legs into a slow cooker or a pressure cooker! A large cast iron pan. This pan is perfect on the stove, or in the oven! This vegetable chopper makes cutting veggies a breeze! Saute the chicken legs in a cast iron skillet. I like to sauté using olive oil, but avocado oil works really well too. I had to use my large 12 inch cast iron skillet to fit in all of the chicken legs. (My son loves leftovers so this big pot of chicken legs will last two days at the most!) It gets really heavy so I try not to move it around that much. Add in the vegetables and continue to cook. After about 8 minutes, I flip the chicken legs and cover it with a lid. How to make a one pan easy chicken leg dinner. In a large cast iron skillet, add olive oil, garlic and onion. Saute until the onions become clear. Add chicken legs and seasonings, and saute 8 minutes on each side. Pour in chicken broth and add vegetables. The chicken legs are done when their internal temperature is 165 degrees. 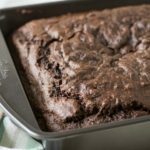 More Delicious Gluten Free Recipes To Try! This is such a great reminder that chicken legs can make for incredible meals, too! We get so stuck in our routine of always using skinless, boneless chicken thighs and chicken breast that the poor drumsticks get forgotten. But we love them, and I can’t wait to try this dish with my family! My kids love chicken legs which they call chicken on the bone. 🙂 They would gobble these up for sure. I like how you can use whatever veggies you have on hand to make these. I love using chicken thighs and drums! They are so economical, yet so flavorful! This meal is so easy and healthy too! Thank you Beth, this is definitely a great dinner that you can make for under $15 for the whole family! I’m always up for chicken legs! These look delish and super easy, and I’m loving all the veggies. Just pinned! I love cooking chicken in cast iron pans – so delicious, and such easy cleanup. I usually do chicken thighs, but I’ll have to try drumsticks next time. You are so right about easy clean up…I just wish cast iron pans weren’t so heavy :-).